The R & S FSH3 is a 100 kHz to 3 GHz handheld spectrum analyzer that is well known for its durability and portable design. This combo TV/analyzer comes equipped with many user-friendly measurement functions that enable it to perform diverse applications. It’s productive when used for cable installation and maintenance, general lab tasks, and verification of devices on the production line. Its versatility also allows for general field use including communications installation, maintenance, and field wireless equipment maintenance and installation. The R & S FSH3 analyzer’s quality design features make it a perfect choice for technicians in the field. It has a metal hydride battery that can operate in remote settings for up to four hours when fully charged. To save power usage of the battery, the FSH3 uses automatic cut-off or auto power down mode. Other useful features include a stable carrying handle, and robust edge protection, making it able to withstand harsh field conditions. The carrying handle is useful for attaching the device in cabinet doors and ensures stability in many similar applications. Technicians will appreciate the FSH3’s ability to be set to an optimized angle of display. Depending on the user’s environment, it can be laid flat to allow operation from above, or can be supported by the strap at the rear to allow operation from the front. The R & S FSH3 spectrum analyzer is also known for simplifying many complex testing tasks. It is operated by means of easy to use, menu based programming via soft keys. The most commonly used functions can be selected and saved directly from the analyzer by the user. In the case of a wrong entry, the user can vary the entry values and enter the correct ones using the Cursor keys or the Rotary knob. The results of testing measurements are shown in the color display with 320 x 240 pixel resolution. If needed, the user can switch to monochrome for a higher contrast display when in challenging lighting conditions, or for field testing. The R&S FSH3 analyzer is also multilingual and can display text in the language of user’s choice. It can display text of up to 9 different languages. When the technician needs to print the data displayed, they can simply connect the analyzer to a printer with RS232 interface using optical RS232 interface cable. You can also easily compile and send a data transfer to an external PC. The model also includes a tracking generator for measurement of gain and attenuation of two port transmission devices. Additionally the analyzer features a pre-amplifier, a tracking generator a TV board. The embedded TV board will allow for precise measurement of TV signals (analog) and demodulation. The video signal (either analog – CCVS or digital TS-ASI TV) can be connected to a MPEG decoder or an external display. Users can easily listen to analog TV signal sounds via headphones. 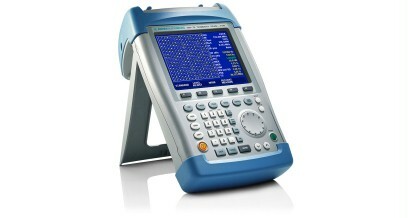 We have a large inventory of quality, refurbished spectrum analyzers in stock. Contact us for more information.